How to remove a tree stump? Stump grinding is the easiest and fastest method of tree stump removal. 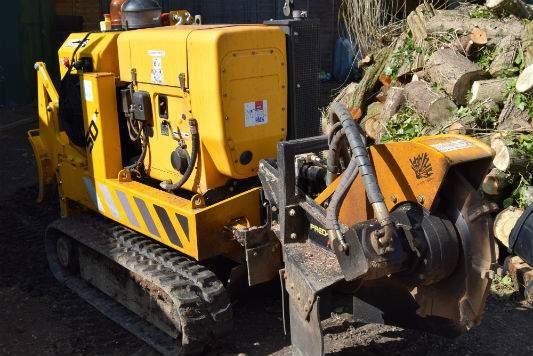 We have the capability to take on small hard access stumps as well as large numbers of stumps. Tree stumps can spoil a lawn, orchard, patio or driveway. Our stump grinder can easily remove unwanted tree stumps with minimal impact. Call us today on 01444 316017 or 07801 756998 for a free quotation to remove your unwanted tree stumps. Holder Tree Services are professional stump grinding experts with specialist machinery to carry out effective stump removal with minimal impact. Our company is fully qualified and insured to carry out this work and all operators follow strict health and safety measures. In addition to stump removal, we also offer Ecoplugs an environmentally friendly and reliable method of preventing tree roots from re-sprouting. It is inserted into the tree stump once felled to halt regrowth. At Holder Tree Services we are proud to work with Predator Power who supply our excellent stump grinding equipment. We currently run the Predator 50 RX large tracked grinder and the Predator 460 grinder for the smaller jobs. Watch our Predator 50 RX in action. The adjustable track base offers 31 inches to 47 inches at the touch of a button, allowing the grinder to fit through a gateway less than three feet. The stump grinder uses a highly accurate and reliable G2B radio control system. It allows us to have the feel and control of a hydraulic lever, whilst having the flexibility and vision of a remote operator. Find out more about our tree services here.